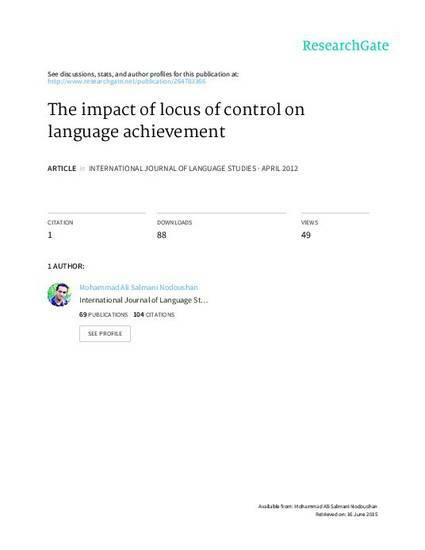 This study hypothesized that students' loci of control affected their language achievement. 198 (N=198) EFL students took the Rotter’s (1966) locus of control test and were classified as locus-internal (ni=78), and locus-external (ne=120). They then took their ordinary courses and at the end of the semester, they were given their exams. Their semester-end cumulative grade point averages (GPA) were compared to their previous-term GPA. SPANOVA results did not identify locus of control (LoC) as a predictor of achievement. Results also indicated that factors like LoC, if at all, interact with proficiency only at the advanced level.